Hello world!!! I would like to introduce myself! 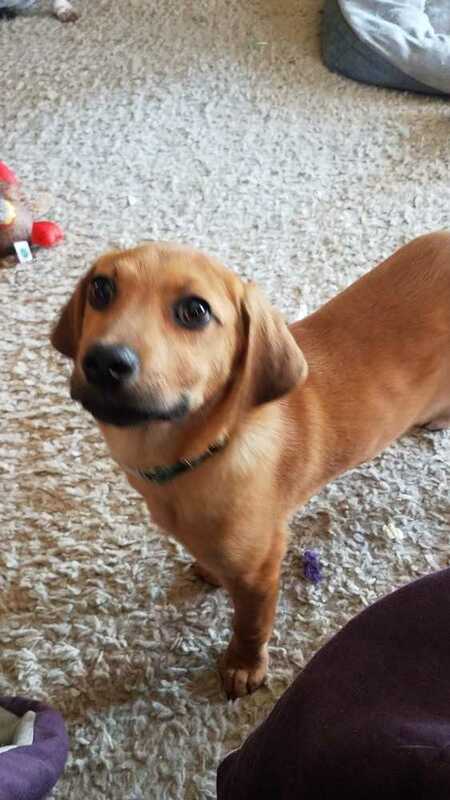 I am a 4 month old Beagle/Mix Puppy who is rambunctious and loves to just keeps on going!!! They say I am going to be a little on the taller side and possibly around 40-45lbs. I am a very playful, sweet, happy puppy. I love to be held and get in lots of snuggles, kisses and playtime. I play with toys and wrestle with my siblings. I have not been exposed to cats yet. I need someone with patience that’s willing to work with me on my basic commands as I get distracted pretty easily since I really would rather be playing. Since I am only a 16 week old puppy I will need to be potty trained so you will need to teach me where to go and how to ask until I get the hang of it. Our foster home has me and my siblings in a large play area during the daytime where we can play and I kennel at night. If you are looking for a puppy that will need LOTS of attention and patience I may be what you are looking for. Apply for me if you want true love in your life forever! I am a forever doggie, not an until something happens doggie! I am current on all my vaccinations, micro chipped, altered, and HW negative. I am fostered in Omaha, NE. My adoption fee is $250.00.